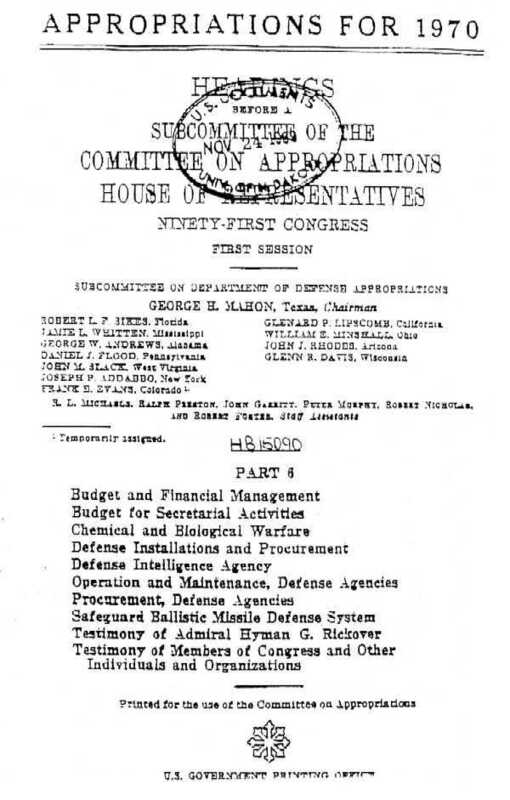 NOTE: The document below (designated as "Part 5") is a true copy of the transcript of the July 1, 1969 testimony of Dr. Donald MacArthur -- a high-level Defense Department biological research administrator -- before the House Committee on Appropriations, Subcommittee on Department of Defense. For those who hold the theory that AIDS is the result of a U.S. biological weapons program, this testimony is a smoking gun. MacArthur was then Deputy Director of Defense Research and Engineering. Congress approved the appropriation for the program. probably working in the same areas. exist and for which no natural immunity could have been acquired. the time and the cost involved? depend to maintain our relative freedom from infectious disease. in approximately 5 years at a total cost of $10 million. troversial endeavor have led us to postpone it for the past 2 years. could be done, there is little that can be done to devise defensive measures. Further research on the origins of HIV: US Congressional hearings on Synthetic Biological Agents (US Government Printing Office); Pentagon AIDS and Why Governments Are Covering-up Gulf War Syndrome by David Guyatt; AIDS as a Weapon of War by Dr. William Douglass; "Emerging Viruses -- AIDS & Ebola" by Dr. Leonard Horowitz; Conf�rence Horowitz � Paris sur l'origine des VIH (Info SIDA Qu�bec); Chemical and Biological Weapons Threat Assessments by the Federation of American Scientists. 34 POPULAR SITES FOR FREE!